Just a quick hit this morning - Managed to get a little more build time in on the Knight, and have been fiddling around with potential posing options. Also put a name to the beast, Khenti-Amentiu, Freeblade Knight and Guardian of the Tombs of Cynopolis on the Forge World of Zhao Arkkad. Added magnets at the torso and neck, and have been twisting the various pieces this way and that to see what works. I think I'm leaning towards the pose shown above, gazing over the top of the blade in a taciturn guardian look. Still quite a ways to go on the build of course but rather digging the jackal head and khopesh blade add-ons! That just looks awesome. I love the head and Blade. I can't wait to see that guy finished. 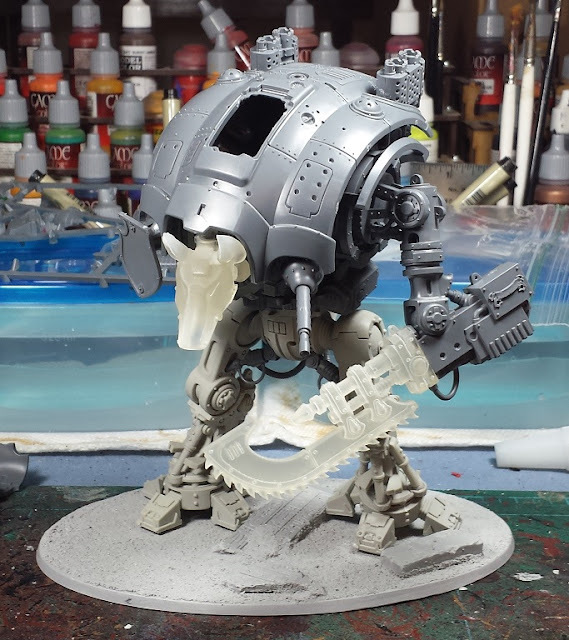 Joel working on a knight, can't get much better! Love the conversion work already! That's looking awesome, the head in particular really gives it a nicely different vibe! Supreme work as always :) Where did you get those poseable legs from? @Greg Hess: Haha! It's been a long time since I did any knights, been fun to work on so far! @30k plus 40k: Thanks! I got the legs from a seller on ebay, under the title "warstrider pattern posable legs". Nice man! Wow that's looking cool, cant wait to see some color on it! The new add-ons are really awesome. Are you going to customize the shoulder and leg armor with egyptian motif green stuff sculpts, too? The Tomb Kings range had some nice inspiration for armor detailing. Sweet bits really give it character. Looking awesome, I like the lean forward pose as well, very mean stance! O yes mate, that looks well good! Stance is menacing, new bits are dead cool - perfect addition for your 1k Sons. @Riot ville: Thanks! Hoping to get the build finished over the weekend! @Agis: Cheers! The head and khopesh are Shapeways 3d prints, and the legs are resincast. Good call on the chevrons - Thinking some blue/yellow sunrays. Been considering either ebony or gold for the head, or perhaps a little of both. @Dai: Thanks! I know I had to have 'em as soon as I saw 'em! I appreciate all the kind words everyone! Cheers!